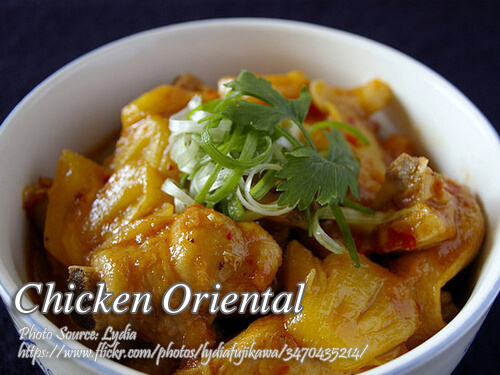 Chicken oriental is a simple chicken pineapple dish that you can prepare and cook in anytime. There are many variation of this chicken and pineapple combination. This recipe is very similar to the usual Asian dish, that uses chicken fillet then coated with batter and fried. In cooking this dish, you can use any part of the chicken. But if your want it to more presentable, chicken use chicken drumsticks. To cook chicken oriental; In a large bowl, marinate chicken in vinegar, olive oil, mustard, salt and pepper for about 2 hours. Drain and reserve marinade. Pan fry chicken until golden brown. Set aside. Boil reserved marinade in a saucepan and combine pineapple syrup, broth, soy sauce and flour. Stir mixture and add chicken pieces. Cook until chicken is tender. Add the snap peas and pineapple chunks. Remove from heat. Arrange in a platter and top with spring onions. In a large bowl, marinate chicken in vinegar, olive oil, mustard, salt and pepper for about 2 hours. Drain and reserve marinade. Pan fry chicken until golden brown. Set aside. Boil reserved marinade in a saucepan and combine pineapple syrup, broth, soy sauce and flour. Stir mixture and add chicken pieces. Cook until chicken is tender. Add the snap peas and pineapple chunks. Remove from heat. Arrange in a platter and top with spring onions. Serve hot.